The original design. Please note that all measurements are center to center. I used 12mm copper pipe for the “loop”, RVS metal strip for the shorting strap and feed point, and a small piece of RVS tube for the isolator. The shortening strip. By moving this strip, the dipole will become longer or shorter, resulting in a different resonance frequency. Feed point, by moving these you will change the impedance of the antenna. I don’t have any equipment for 6m, except a small handy (Kenwood TH-F7) which is capable to receive 6m USB. So after building the antenna, I first attached that radio to the squalo to see if it’s doing something. And yes, it worked! 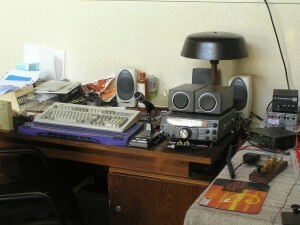 There was an Italian 6m contest, and I heard lots of stations. Next I hooked up the squalo to my MiniVNA to did some tuning. I tuned it (by moving the shortening strip and feed point) to let it resonate on 50.500 MHz, and adjusted the feed point to get 50 ohms on that frequency. 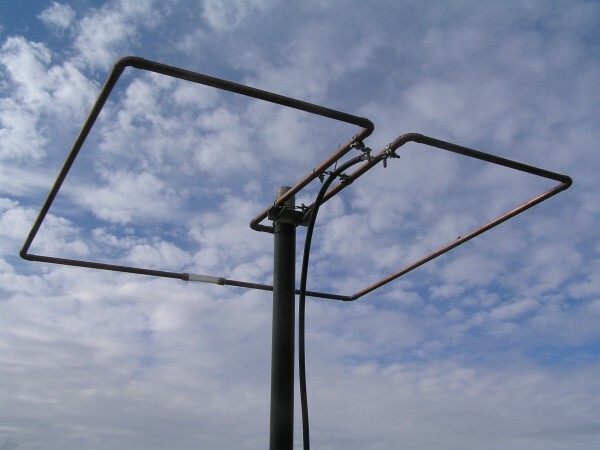 The antenna has an operating bandwidth of about 1 MHz, so it covers at least 50 – 51 MHz. That part of the band includes the CW and SSB areas, aswell as the beacons. I experimented with turning the antenna around while receiving a steady signal (a beacon). There is no “dip” (like dipoles have), but when receiving at one of the sides the signals are somewhat weaker. I didn’t notice any front/back ratio. The mount bracket. I used a aluminium strip for this, but you better use some more solid metal for this. 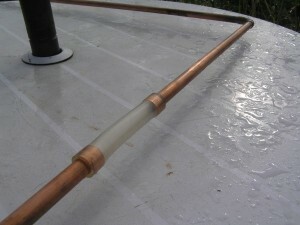 A piece of not-too-flexible PVC tube is used to fix the end points of the dipole. On August 15th 2009 I went to Adri to help him with the antennas. He’s blind, so he needs a helping hand now and then. This time we moved his “north” antenna from the living room to the roof. Also, this was a good moment to put the squalo in place, on the south side of his home. I did some final tuning (using my MiniVNA and laptop). Unfortunately the band was closed at that moment. 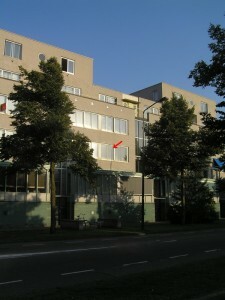 But the day after I received an email that he worked EA5, which is over 1500 km from his site. So the antenna seems to be working. The squalo on its definitive place, next to the Diamond 6/2/70 vertical, on the balcony rail on the south side of Adri’s apartment. A view from the balcony. The buildings on the background are about 10m higher than the antennas. 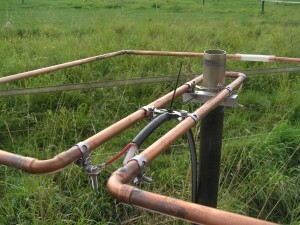 Bill VE3BXP is one of the many radio amateurs who built this antenna, inspired by this article on my website. He added an extra support by using a PVC pipe and T-junction, which also acts as insulator. Jan PA2JSZ sent me this picture of his version of the 6m squalo. 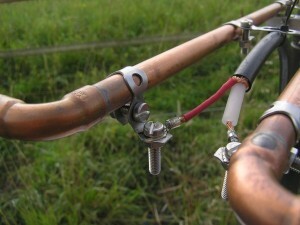 Vladimir EW8AU suggests to feed the coax cable through the copper tube. Adri has his main equipment in the living room. You can see his TS-2000, TM-V71, remote control of his MFJ loop, and one of his talking watt meters. The small box with yellow buttons (in front of the TS-2000) was made by Tjalling PE1RQM, it enables some extra functions of the voice synthesizer in the TS-2000, like speaking the frequency and the signal strength. There’s also a Kent morse key on the picture, as well as a Junker key. The blue “thing” (beneath the keyboard) is a braille display. Adri’s vintage shack: a Hallicrafters SX 117 (top left), a Racal RA17L (bottom left) and a Murphy B41 (right). I placed a vertical on the north side of his apartment, on the roof of his living room. Before that, the antenna was IN the living room. 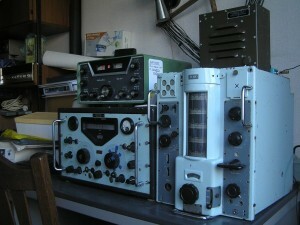 Hello friend, I want to build one of these for our radio club but only have a swr meter and an ohm meter can I fully adjust and tune this with these meters? The SWR meter tells you something about the impedance of the antenna, it tells nothing about the resonance frequency. Using a VNA or antenna analyser is therefore recommended. When not available the SWR meter will help you to get a working antenna, but the result might not be optimal. Could you please post the beam pattern? Mic, I don’t have accurate measurements, but I know that it’s an oval shaped pattern, where the gain to the sides is about 3dB less than to the front and back. 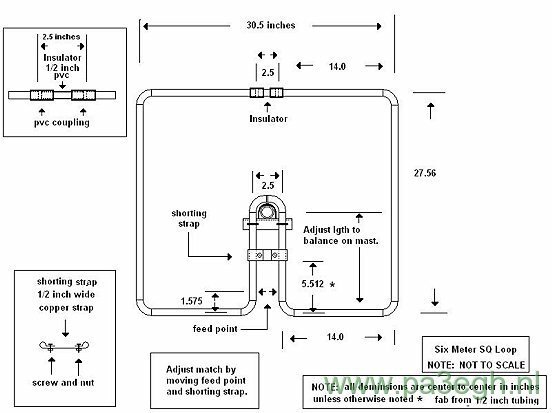 Thank you for your reply, one last question, the only measurement I do not see is the distance that goes from the the side with the 2–14 inch sides….how long is the pipe that goes back to the around the mast, it shows the 5 1/2 inches to the shorting strap but what is the rest of the measurement? Thank you ever so much again I relly appreciate your help please respond to kd4ysh@yahoo.com thanks friend. Joe, this is not a part of the antenna itself, it’s just a way to allow mounting the antenna to a pole. So make it long enough to have the pole in the center of the antenna, so that it balances (weight) at the pole mount. Hello Ernest, thank you for answering my questions I have a couple more, I have 3 motorola fm 6 meter radios not side band but fm, should I build the square halo antenna or a verticle polarized? Are the 6 meter repeaters in my state usually fm or side band, I really like the horizontal antenna for the least wind resistance the slimjim 6 meter antenna is like 14 feet long. Thank you ever so much for your guidance thanks. Joe, I live in the Netherlands so I’m not familiar with the VHF repeaters in the US. FM repeaters are usually vertical polarized, so the slim jim will be your choice for this. Horizontal polarization is commonly used for SSB and CW communications, so the squalo will be very suitable for this. I’m interested by your antenna but, I think there is some problems with your inch-mm conversion. In the table I see that 30,5 inches equals 64 mm and 27,56 inches equals 700mm. I think there is a mixture in the table. Fabian, you’re absolutely right. It’s probably some copy & paste failure. I’ve updated the table, 30.5 inches equals 775 mm. Thank you for the correction. Hello Ernest. I finally found what I have been looking for !!! We live in a senior citizens mobile home park with very restrictive rules on antennas . I have a all band HF verticle that I convinced them in thinking it is for emergency use so I was allowed to have it . 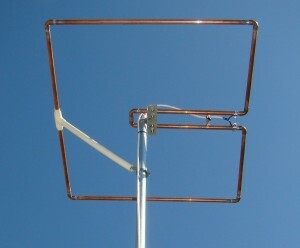 I needed an antenna that looks like a tv antenna which they will allow and the squalo will work . Question ,are the side dimentions and front & back of the pipe inside or outside ?Thank you for the construction and use of the antenna . Jim, nice to hear that this antenna has enough “stealth” capabilities for your purpose 😉 The original design mentions 1/2 inch tubing. However the diameter is not critical, so choose a diameter that is strong enough to stay in shape. I used 12mm copper tubes, which is rather heavy but very solid. You can also bend a piece of sturdy metal wire in the correct shape. All given dimensions are center to center, unless otherwise noted. Sizes are not very critical, since you can easily adjust the resonance frequency by moving the shortning strap. I built the antenna to the specs published and unless I have made a huge error reading the drawing something is bad wrong. I have a RigExpert RG-54 antenna analyzer and all my parameters are terrible. Using the drawing the initial settings these these are my readings: swr 6.1, R = 7.7ohms, IZI = 11.4 ohms, X= 8.7 ohms, L =28nH. I’m using a 6′ lead of RG213 for the connection. Any ideas on where to look for problems? I hope you didn’t forget the shortening strap? I was looking up the 6m squalo and ran across your page. 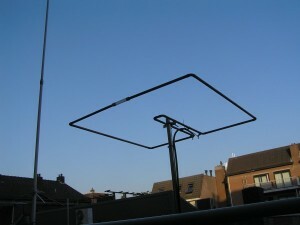 I just finish building one of these antennas using the same plans. By just finished, I mean I just put the last bolt in the mast support about an hour ago. I will attach the feed line tomorrow and start tuning it. 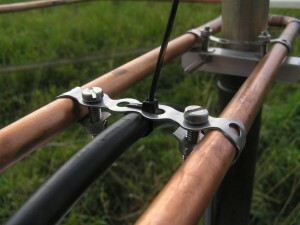 Do you know if this antenna needs an RF choke by wrapping the feed line? I was thinking that it might in order to reduce the common mode current on the outside of the coax braid. 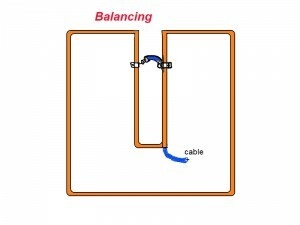 Feeding a balanced antenna with an unbalanced feed line is bound to have common mode problems. Is this something you have tested or tried? Also, I was wondering how long of a feed line tail to attach to it? I will be using a barrel connector to attach the rest of the coax to run to my rig. I was just wondering if there was a suggestion on how long to make the piece attached to the antenna? Formally a 1:1 balun should be used, since this is a symmetric antenna (balanced) feeded with coax (unbalanced). However, I’ve never experienced any issues without the balun. You should tune the antenna so that its impedance is 50 ohms. The result is that the length of the feeder doesn’t matter anymore, since the whole system is 50 ohms. If you plan to use a balun, first tune the antenna to 50 ohms with coax directly attached (without balun). When the resonance frequency antenna is correct and the impedance is 50 ohms, insert the balun and verify that the antenna system is still 50 ohms. 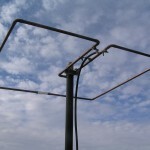 If you have some pictures of your antenna, please send me an email with the pictures attached and I will add them to this article to inspire future builders and share the knowledge. I would be interested in any information on a stacking harness. I built an almost identical 50 MHz square loop about 8 years ago and mounted it on my pickup that I used for pulling my camper. It exhibited a very low SWR over the bottom half of 50 Mhz. I used it with my FT-857d and it consistently out performed my 1/4 wave steel whip that I also had on the truck. Unfortunately, I lost my original drawing with the measurements and the antenna itself was destroyed by a very low tree limb while off road 4×4 in a mountain forest (heading for a high point on that mountain!). The only difference was that I used a shorter distance from the shorting bar to the support mast in order to put the antenna more forward over the pickup bed from the bumper and then added a support from the mast to the pvc spacer. Now you have me wanting to build another square halo for a summer project! 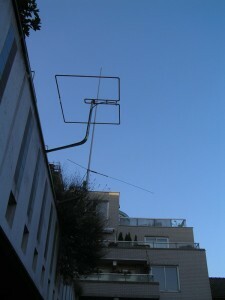 newly start the construction of the antenna scualo six meters, I have two queries. 1) The antenna has about the same gain in both front and rear direction, about -3dB on the sides. 2) No isolation is needed. The shortening strap is part of the radiating system, the part between strap and mast has only a mechanical purpose, not an electrical. I suggest you do not isolate the antenna for lightning protection (assuming your mast/pole is grounded properly). to start cutting the pieces measures the parts where this short strap missing. Sorry Oscar, maybe I don’t understand your question, but I wouldn’t cut the pipe at the position of the shorting strap. Thank you for your answer, just missing the 2 pieces measures where this strap short, these measures are not lacking tubes ok.
Ok, now I understand you. That size is not critical. The drawing says: “adjust length to balance on mast”, so I would suggest about 15 inches (38 cm, just a bit more than the length of the sides). Ernest friend Thanks for your answers, please check the plane of the antenna missing two measures. 73 good luck. the measurements given are center to center or outside tubing ? Aall measurements are center to center. I’ve updated the text, since you’re not the first asking this. I have built a Squalo for 2m. I am using it in a vertical plane. Defensively not my 7/8 wave vertical but still had nice comms with repeaters some 100km away running 50W and antenna at 6m. Then an brain flash hit me : why not a yagi style beam consisting of Squalo elements? After all the Squalo basically could be seen as a “half size” quad loop… Hi hi. Are there someone who have tried it… Just trying not to spend many a nights number crunching to model and try to built it just to realise a standard quad beam works way better. 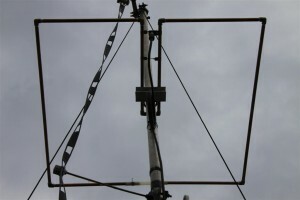 Ernest, thank you for sharing your knowledge of the Squalo antenna for 6 meters. I have built one to your specifications and have made a number of local contacts with it while lying on my workbench inside my house. However, it needs to go outside and onto a mast as my wife doesn’t appreciate exotic copper sculpture art in the house for some silly reason. Thomas, the mast’s material doesn’t matter. 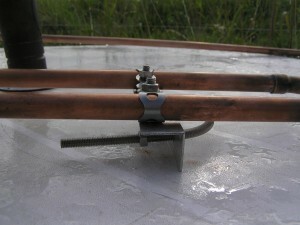 Everything behind the shortening clamp is not part (electrically) of the antenna. What would be the max rf power for the antenna? I don’t have any power ratings, it depends on the construction. My construction would easily allow a few hundred watts.